Hundreds of scientific papers relevant to The Bahamas are now archived in this searchable database. Use the search box in the upper right to find what you are most interested in. Please let us know if you don’t see your papers included – we will get them up as soon as we can! Alvarez, F., T.M. Iliffe and J.L. Villalobos 2006 Macromaxillocarididae, a new family of stenopodidean shrimp from an anchialine cave in the Bahamas, with the description of Macromaxillocaris bahamaensis, n. gen., n. sp. Broad, K. and J.N. Sanchirico 2008 Local perspectives on marine reserve creation in the Bahamas. Bruno. J.F., W.F. Precht, P.S. Vroom and R.B. Aronson 2013 Coral reef baselines: how much macroalgae is natural? Claridge, D. E. 2008 Visual and acoustic surveys for beaked whales in the Great Bahama Canyon: determining their distribution, abundance and population structure. Dolman, S.J. et. al 2007 Assessing abundance trends of deep-diving cetaceans off Great Abaco Island in the Bahamas. Hayes, W. K. 2003 Can San Salvador's iguanas and seabirds be saved? Hayes, W. K., J. 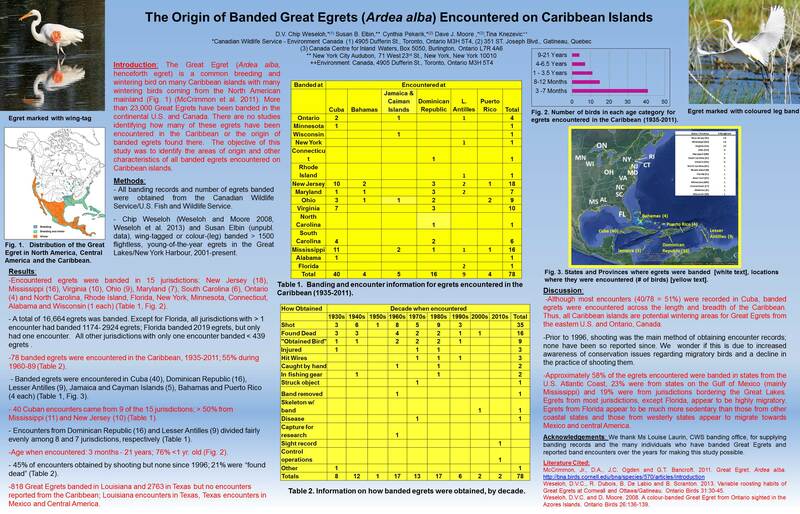 B. Iverson, C. R. Knapp, and R. L. Carter 2012 Do invasive rodents impact endangered insular iguana populations? Hickmott, L. S. 2005 Diving Behaviour and Foraging Ecology of Blainville's and Cuvier's Beaked Whales in the Northern Bahamas. Hines, D. E., and J. R. Pawlik 2012 Assessing the antipredatory defensive strategies of Caribbean non-scleractinian zoantharians (Cnidaria): is the sting the only thing? Hines, D.E. and Pawlik, J.R. 2012 Assessing the antipredatory defensive strategies of Caribbean non-scleractinian zoantharians (Cnidaria): Is the sting the only thing? Hixon, M.A 2004 How do so many species of coral-reef fishes coexist? Jones, A.C., Blum, J.E. and Pawlik, J.R 2005 Testing for defensive synergy in Caribbean sponges: Bad taste or glass spicules? Kulbicki, M., J. Beets, P. Chabanet, K. Cure, E. Darling, S. R. Floeter, R. Galzin, A. Green, M. Harmelin-Vivien, M. Hixon, Y. Letourneur, T. L. de Loma, T. McClanahan, J. McIlwain, G. MouTham, R. Myers, J. K. O'Leary, S. Planes, L. Vigliola, and L. Wantiez. 2012 Distributions of Indo-Pacific lionfishes Pterois spp. in their native ranges: implications for the Atlantic invasion. Layman, C.A. 2007 What can stable isotope ratios reveal about mangroves as fish habitat? Mumby PJæ 2009 Herbivory vs. corallivory: Are parrotfish good or bad for Caribbean reefs? Pawlik, J.R. 1998 Coral reef sponges: Do predatory fishes affect their distribution? Pawlik, J.R., McFall, G., and Zea, S. 2002 Does the odor from sponges of the genus Ircinia protect them from fish predators? Puyana, M., Fenical, W., and Pawlik, J.R. 2003 Are there activated chemical defenses in sponges of the genus Aplysina from the Caribbean? Quick, N. et. al 2009 Vocal behaviour of short-finned pilot whales pre, during and post exposure to playbacks of mid frequency active sonar and killer whale calls. Schoener, T.W., D.A. Spiller, and J.B. Losos 2002 Predation on a common Anolis lizard: Can the food-web effects of a devastating predator be reversed? Silliman, B. R., J. van de Koppel, M. D. Bertness, L. Stanton, and I. Mendelsohn 2005 Drought, snails, and large-scale die-off of southern U.S. salt marshes. Stoner, E.W., Layman, C.A., Yeager, L.A., and Hassett, H. 2011 Effect of anthropogenic disturbance on abundance and size of the benthic jellyfish Cassiopea spp. Walters, K.D. and Pawlik, J.R. 2005 Is there a trade-off between wound-healing and chemical defenses among Caribbean reef sponges? Yeager L.A, C.A. Layman and C.M. Hammerschlag-Peyer 2014 Diet variation of a generalist fish predator, grey snapper Lutjanus griseus, across an estuarine gradient: trade-offs of quantity for quality? Ketten D.R. 2014 Sonars and Strandings: Are Beaked Whales the Aquatic Acoustic Canary?